This is a basic knowledge about how to generate very high DC Voltage from 240V main AC home supply. 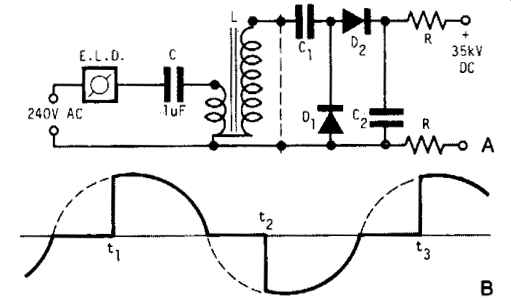 The design of this circuit is very simple. A light dimmer, a 1 pF capacitor and a 12 V car ignition coil form the simple line powered High Voltage (HV) generator. The current in the dimmer is shown in Fig. B. 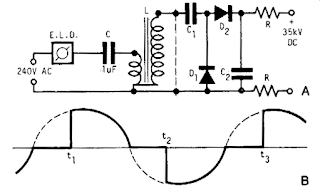 At times t1, t2,..., set by the dimmer switch, the inner triac of the dimmer switches on, and a very high and very fast current pulse charges the capacitor through the primary of the induction coil. Then at a rate of 120 times per second for a 60 Hz line, a very high voltage pulse appears at the secondary of the coil. To obtain an HV dc output, use a voltage doubler. D1 and D2 are selenium rectifiers (TV 18 Siemens or ITT) utilized for the supply of television sets. High value output shock protection resistors, R, are recommended when suitable.